When it comes to sound quality for your videos or vlogging, you don’t want to skimp. If that microphone makes your voice squeaky or unreal, it’s failed you. For this reason, you want to find the best microphone for your recordings. But what if you shoot your videos with a DSLR? Is there a special shotgun mic that’s the best for your style or situation? And why is it called a shotgun anyway? Read on for our comparison of the best shotgun microphones to use with your DSLR camera. We explain the terminology and what to look for in that mic. Here are the best selections along with why and when they’re great. This mic wins praise for being the best shotgun around from industry reviewers and users alike. Its superior audio quality is designed with DSLR cameras in mind for the serious enthusiast or professional who wants a great range across a variety of conditions. Reviewers note there is nothing missing on this mic and extraordinarily little to criticize. It has both high sensitivity to its extensive frequency range and minimal pickup of low background noises, even at otherwise noisy sports events at a distance or crowded close-up interviews. Its two-step high pass filter allows you the artistic freedom to select how much background to eliminate. Controls to change settings or adjustments are located on the back of the mic, making it easily accessible to the videographer. There have been reports from users of a buzzing that won’t go away during some recording conditions and on some DSLRs, but it’s not an overall trend. This is a mono mic, which makes it less than ideal for music or nature sound recording. Users are particularly pleased with the audio quality picking up dialogue and other concentrated directional applications. It comes with an integrated windscreen and appropriate thread system for boom mounting so you are ready for versatile conditions right out of the box. If you regularly need to change the distance range within which you’re working for your DSLR-based video, this Sennheiser mic has that specialized control feature. The capability to switch sensitivities based on short and long distances to your subject make this mic ideal for those situations. Its all-metal build gives it a durability not always found in shotgun mics. This mic is considered a compact model, making it a good choice for settings where you need to remain unobtrusive. Users say that it works well for years without any problems. Optional accessories for this mic include an upgraded wind muff (basic windscreen included with mic) and a long distance cable and power adapter kit. No everyone is happy with this mic, though. Some note it seems fragile, despite the construction, and other say it breaks quickly. There don’t seem to be any patterns or trends to determine why this may be occurring. One point to keep in mind is that this mic is best used with a DSLR, as this was what it was designed for. Using it on other equipment such as smartphones won’t produce good results. If DSLR work is your focus, however, this model offers you flexibility across distances not found in many other shotgun mics. It may look like some strange creature from a sci-fi film, but the Tascam two-mic system picks up a depth of sounds you won’t get from a uni-mic unit. Because it selects the recording from a cross-hatch pattern, you’ll want to keep this shotgun trained on your subject at all times. You can also move the two mics up to 180 degrees in different directions to create an artistic sound capture. This shotgun comes with more than the usual hot shoe mount. 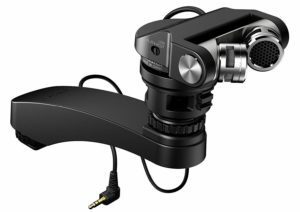 It also has a floating (flexible) noise isolation arm you can add between the mic and hot shoe to further protect your audio quality from camera movement noise. A windscreen of the fuzzy variety is also included. If your camera is a model that doesn’t have a lot of battery power, or for longer shooting situations, you will want to be aware of the power draw this mic has from your camera. Other than this, there are few negative comments about the quality or effectiveness of this mic. Users and reviewers note that the wide frequency range can pick up audio from nearby or from a distance. This is a true stereo system. If recording music is a vital part of your videography, this shotgun mic will make your DSLR work shine. If you regularly shoot at a distance with adjustable lens focal range, this Zoom mic is for you. In this case, your audio is recorded separately from your video, and you sync the two in post-production. Note that you’ll need the audio recorder as well as the mic, which adds cost and weight to your calculation. Think about shooting sports events or wildlife where zoom sound capture is important, though, and you can see how great this mic can be. It shines best in the outdoors, though it does well indoors for zoom work too. Reviewers say this might capture the best sound quality of any mic on our list, specifically because it does not work through your DSLR. In addition to the unidirectional mic, it has two condensers to add more depth to your audio with electronic adjustments that mimic stereo. You can adjust the amount of center-weighted sound and blend it with the side direction frequencies in post-production. A preamp cuts distortion from loud recording environments, making it the perfect partner for shooting zoom videos of live events. Some users note that the post-production syncing and adjusting to bring stereo effects into the original mono recording do not work as well as they’d like. Others say that the low end of frequency range is not as good as the higher registers. Taken as a whole, though, this variable distance mic makes adding zoom through your DSLR video a great possibility. This shotgun is proven to be highly directive, making it great for interviews from a distance as well as up close and personal. The closer you are, the better your sound will be. With the usual metal construction and high-quality build you find from Sennheiser, this mic is exceptionally durable for extensive field work. Indie filmmakers are also strong believers in this mic because of its size and versatility. It remains sensitive to desired sound on a boom without becoming muddied with background or external noise. Other great uses in advertising and for commercials give this mic a breadth of coverage to suit many needs. It has the advantage of using variable power sources, either from the camera through the XLR cable for long distances or with its internal battery. When using the mic on its own battery, the low power indicator will notify you when you have eight hours remaining. Being able to switch between internal battery and camera power makes it easy to conserve the power where you need it the most in any given situation. This mic has the standard low cut filter setting, as well as clear quality across its range. This is particularly useful for dialogue, since this usually occurs in mid to high registers. While users note it might not offer you distance from your subject, it is small enough to use as a handheld without overwhelming the video capture. If your videos focus on nature, wildlife, and the environment, this Rode model catches the nuances in a true stereophonic cross-hatched pattern. While it will filter out rear noises, it grabs the appropriate amount of side frequencies to make for a realistic natural sound. Settings to cut out low frequency sounds such as traffic give you options when you’re shooting and recording. Adjustability makes it perfect for loud events like rock concerts and sports venues, but it also shines in the quiet details. The specialized cradle mounting system sits in the camera hot shoe (also boom compatible) and avoids picking up camera mechanical noises and disturbances from movement. An in-system booster helps to add vibrancy to the video recording in your DSLR. Users note the life-like quality of the stereo sound picked up by this shotgun. While it lacks physical adjustments of the mics themselves, it has plenty of settings to choose your frequency and audio capture. It works best for close-up recording under ten feet. The length is deceiving, since it looks like a softball sitting on top of your camera and is taller rather than longer. It will attract some attention because of its shape and configuration. Give people a listen to the sound it produces, and most will be convinced it’s a great new direction for shotgun mics. Users note this is a decent quality full stereo mic, though not up to the same audio quality standards as others on our list. The hot shoe shock mount keeps your recording safe from inadvertent camera noises. The low pass filter (low cut) limits unwanted hiss and pop. This mic earns a slightly lower audio quality rating because its frequency pickup range is not as extensive as the more expensive models on our list. It is super-lightweight, making it easy to use if this is your first entry-level DSLR shotgun mic. It has a permanently attached recording cable which some users consider a negative since these can wear out with time. Reviewers remind people that this mic only mounts on your DSLR, not on a travel tripod or boom. While its battery life is extensive, batteries can continue to power the gear and should be removed when not in use for extended periods of time. If your intentions for this mic are more casual and you don’t want to spend a lot of money on something for fun, this Azden makes the grade to cover the basics. Traveling with your subject or on assignment in questionable or unsafe conditions are perfect uses for this shotgun. Count on it for dialogue and basic environmental sounds in most situations. If you’re already familiar with shotgun mics, some of this might be a quick review for you. If you’re not, though, read on to learn what you need to know about selecting and using this equipment. While your investment isn’t huge in this piece of gear, you don’t want to make an obvious mistake because the choice doesn’t match your style of DSLR video shooting. Technically, a shotgun microphone is any single direction mic with a narrow range of high sensitivity to sound. When you connect it to the DSLR camera, it records the audio to match the video with the mic pointed at the same subject as the imaging. If the mic is pointed at anything else, it won’t match the action. For this reason, it’s important to maintain control of the mic’s aim. Precision is key, because the angle cone where it picks up clear tones remains narrow even further away from the mic. It blocks out noise to the sides and behind it. It is also vital to understand your DSLR as the first step of your selection process. Some autofocusing systems, for example, create noise that’s loud enough to be picked up on video recordings. Not all have flash shoes, which is one way to mount a mic, and on older DSLRs, jacks might be missing. While most recent DSLR models have decent sound quality that’s good enough to record for social media or casual use, for professional projects, you’ll want a higher quality external mic. Shotgun mics typically connect to your DSLR through the 1/8” mic jack (also known as 3.5mm). The sound quality of the microphone will then determine the audio attached to your video, and the difference from what’s resident in your camera will be significant. Ideally, your lens and your mic should be 100% aligned. If you as the videographer move your framing, the mic follows suit for the sound. 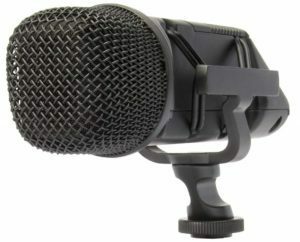 The mounting system also protects the microphone from picking up unwanted sounds of the camera working, translating into background static, whirring, or humming on your video. Mounts are separate and apart from the mic itself. The mic may have a built-in shock mount that looks like a nest of elastic bands designed to minimize accidental sounds due to movement. Others are frames, boxes or cradles. Some mics can be mounted on the hot shoe (flash shoe) of your DSLR. This location keeps things aligned while minimizing the cumbersome extra weight of an external frame. It maintains the greatest directional control, is the easiest to connect and disconnect, and is the preferred method of those with mic experience. Let’s say you’re a vlogger and you use your DSLR to capture those videos. In this case, the camera may be on a mini tripod set at a height appropriate to film your face without creating strange distortions. If the mic is mounted on the camera, it brings the shotgun mic in close as well. You can also put the mic on a solo tripod, with the direction pointed at your face but out of view of the camera. A third solution is placing it on a boom pointed down to you. However, not all mics have the connections to work on a tripod or boom. Most shotgun mics are also designed for handheld use. Think of a setting where you’d be talking with someone in a less staged setting, like a person-on-the-street or in-studio interview. You’re face-to-face with your subject, trying to capture their words to the exclusion of background noise, all while making a video on your DSLR. You’ve seen this situation quite a bit on television news, and in fact, a shotgun mic is what is used in most of those cases. Not all shotgun mics on our list have the ability to work as a handheld, though. If this kind of filming is important to you, you’ll want a mic designed for that flexibility. Rode VideoMic Pro A Mono 10-15 feet 6 in. 3 oz. Sennheiser MKK 400 A Mono Variable 5 in. 2 oz. Zoom SSH-6 B+ Electronic stereo Variable 9 in. 9 oz. 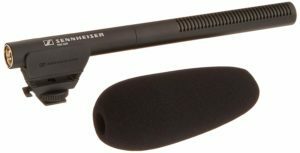 Sennheiser MKE 600 A Mono 10 feet 10 in. 4 oz. Rode Stereo VideoMic A Stereo 20 feet 5 in. 4 oz. Azden SMX-10 B Mono 10 feet 7 in. 2 oz. Your mic is effective within certain distances to your subject based on the frequency range within which the mic captures sound. For example, if you’re working in a small room and external conditions are generally quiet, you won’t need the same range as if you were shooting on a busy street. If you need to catch the audio of wildlife across a field, you’ll need a zoom shotgun to cover the separation. Since this the primary purpose of the mic, you’ll want one that tests well for sound quality under the kinds of circumstances you frequent. For example, if you commonly shoot outdoors, you want one with built-in low pass (low cut or noise cancel) filtering and accessories to help with wind interference. Quiet conditions or loud environments change your audio capture dynamics too. You always want to buy the best mic you can afford, no matter what the specifics. Mics should be able to protect your sound quality from wind noise, from background hums like street noise, and from vibrations due to mechanical movements like autofocusing or lens zoom. You also want a mic that reaches the distance you need from your camera. How is a shotgun microphone different from the mic in my camera? Why isn’t the DSLR mic quality as good as my expensive camera? Should all video be shot using an external microphone? What’s most important for shooting professional quality studio videos? What shotgun mics would photojournalists need? 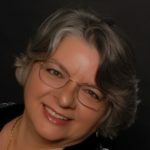 How is recording music different from recording dialogue? Which shotgun mics work best for solo videography? Here are the things people usually want to know about shotgun microphones used on their DSLR cameras. Much of this applies to other kinds of cameras too, so if you have depth in your photog gear bag, you’ll learn even more. Rode VideoMic Pro Overall A Mono 6 in. Sennheiser MKK 400 Variable Distances A Mono 5 in. Zoom SSH-6 Zoom Recording B+ Electronic stereo 9 in. 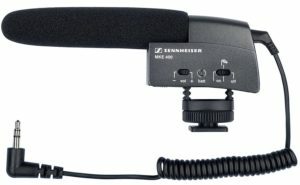 Sennheiser MKE 600 Photo-Journalism A Mono 10 in. Rode Stereo VideoMic Nature A Stereo 5 in. Azden SMX-10 Budget B Mono 7 in. The microphone in your camera works across a broad range of space. The internal mic is located on the face of the gear through a set of holes clustered together. It hears everything in front of the camera as well as the noises from inside. As an illustration, hold a piece of paper in front of your camera so it’s flat, like the end of your lens would be pressing on it completely. That’s what the internal mic hears, plus mechanical noises as the autofocus or zoom adjust. You receive the sounds in front of you, but also the stuff out to the sides past 180 degrees and the noise behind the mic too. Now roll that paper into a tube and hold it on top of the lens. The shotgun mic hears everything that comes in the tube but blocks out the noise from the sides and behind. It narrows your target to your main subject alone. I know you probably paid a lot for that camera, but DSLRs are made to capture still images, not videos, and an expensive camera does not equal a good internal microphone. The ability to shoot videos is a nice addition made by manufacturers over the past decade and more, and the quality on those can be terrific. But the audio portion hasn’t kept pace. Not only is the quality of the mic different from the rest of the camera, but the range of frequencies it can hear is muddied. By this, we mean it hears everything, including the pop of the shutter release. It can’t distinguish between frequencies, so it grabs everything it hears. Finally, shotgun mics can adjust what they hear through the magic of electronics, so it can change the distance, differentiate between street sounds and human dialogue, and only grab what it should have. If you’re doing a person-on-the-street interview, you don’t want the distant traffic noise, even if it’s in that cone of direction the shotgun mic faces. Internal camera mics don’t have that level of engineering sophistication – yet. This is an artistic choice. Let’s say you’re shooting raw (and by raw, we mean gritty reality) scenes of something emotionally moving, and you want to capture the big feeling of the scene. A distant horn or passing wheels on pavement are as much a part of that emotion as what the people are saying. On the other hand, if you’re shooting a musical performance, you want the sounds of music. These could be originating from a number of locations, though, including speakers to the sides of the mic. Noise from directions other than your subject can also be controlled through low pass or low cut filtering. If you’re doing interviews, you want the person’s words. You as the interviewer and the subject are your range, and that’s best accomplished with an external mic, unless, of course, you are going for that artistic expression we mentioned before. Rode VideoMic Pro 10-15 feet Built-in shock for hot shoe 70 hours, 9 volt 3 oz. Sennheiser MKK 400 Variable Built-in shock for hot shoe 300 hours, AAA battery 2 oz. Zoom SSH-6 Variable On recorder From recorder 9 oz. Sennheiser MKE 600 10 feet Handheld or shock for hot shoe 150 hours on AA battery; or from camera 4 oz. 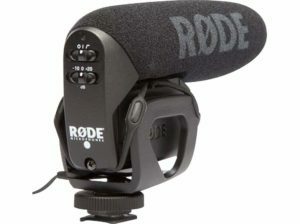 Rode Stereo VideoMic 20 feet Built-in shock for hot shoe 100 hours, 9 volt 4 oz. Azden SMX-10 10 feet Built-in shock for hot shoe 400 hours, AAA battery 2 oz. Moving into a smaller venue has its own issues for recording video sound. In a studio, you may also need to set your camera and your microphone in different focal planes. You don’t want the camera looking up your nose, and you don’t want the mic aimed over your head. If the mic is too close to your face, it might even hear you breathing too, or the room might echo. There are adjustments to placement to fix all of these issues, and sometimes you might want to invest in more accessories than arrive in the mic’s shipping box. It does depend on how you plan to use the video. Something might be acceptable for your personal social media posting, but you wouldn’t want the same casual effects on a professional YouTube channel. If you think you’ll primarily be using the shotgun for handheld work, you want a smaller, more discreet unit. If you’re shooting the video yourself with the shotgun attached to your camera and weight isn’t an issue, you can go for something larger that still gives you versatility for other circumstances. Consider adding a heftier wind muff for outdoor use and any other accessories right away to make sure you’re ready for any kinds of recording conditions. Music requires a broader frequency range. High notes and low notes from musical instruments register in broader frequencies than the range of human voices. Singing can also expand the usual range of a speaking human voice. You also want a shotgun mic that works at a distance. Unless you know you’re always going to be within ten feet of your subject, you want to adjust the distance to suit the situation. True stereo sound is best for high end audio to match your great DSLR video. It might be more about the mounting system and less about the shotgun mic when you’re shooting solo. Working on your own means you have to maintain control of both the DSLR for the video and the mic for the audio, triggering both together, and that means having them connected in a way that makes sense for your style of working. If you work on a tripod, you have more control and can stretch the edges of what would be considered a controlled environment. The precursor to making any shotgun microphone selection for your DSLR camera is deciding how and when you’d use it. The conditions and your ability to manage the camera and mic together will guide you in determining the features and type best for you. Here are the criteria we’ve included in our comparison. Rode VideoMic Pro Overall A Mono 10-15 feet Built-in shock for hot shoe 70 hours, 9 volt 6 in. 3 oz. Sennheiser MKK 400 Variable Distances A Mono Variable Built-in shock for hot shoe 300 hours, AAA battery 5 in. 2 oz. Zoom SSH-6 Zoom Recording B+ Electronic stereo Variable On recorder From recorder 9 in. 9 oz. Sennheiser MKE 600 Photo-Journalism A Mono 10 feet Handheld or shock for hot shoe 150 hours on AA battery; or from camera 10 in. 4 oz. Rode Stereo VideoMic Nature A Stereo 20 feet Built-in shock for hot shoe 100 hours, 9 volt 5 in. 4 oz. Azden SMX-10 Budget B Mono 10 feet Built-in shock for hot shoe 400 hours, AAA battery 7 in. 2 oz. We’ve applied a letter grade to the mic based on what users and reviewers say about its audio quality. Additional notes on the mics are provided in the comments sections, along with feedback from reviewers and users about their experiences. Microphones record in three ways: Mono (one channel), stereo (two or more channels) and electronic stereo (electronically produced multiple channels). The highest quality for depth of audio is stereo; electronically-created audio will never sound as good as the real thing. Mono is great for dialogue. Some mics work best at particular distances or are limited by their frequency to a primary range. Others are variable by their design or have an adjustment to filter for distance. Set or variable distances are noted here. We list the type of mounting system that comes with the shotgun mic. Also, if it has other capabilities, limitations or attachments, we add that in our comments. Shotgun mics are generally powered by batteries, either rechargeable or replaceable. You’ll want to know how long that battery lasts to ensure it can meet your recording needs. We note hours of charge and battery type in this criterion and add other specifics in the comments. This may seem an odd thing to include, but you don’t want a mic that’s so long, it wobbles in the mounting system, causes you to boggle the camera or gets in the way of your video. Think about your handheld use, too, with regard to this category. Since most people use their shotgun primarily mounted on the camera, weight is a feature not to be overlooked. Even in using this as a handheld, you don’t want long interviews to be a strain, and suspending this from a human-held boom overhead doubles that need. Consider the use of a tripod with both the DSLR and the mic attached for longer sessions to maintain video quality. I don’t understand why the Takstar was not atleast the runner up. It probably should have been the winner. If battery life was the weakest point, then a lithium battery would help with that problem. What about SHURE VP83 and Audio Technica? Please Elaborate on output of each mic whether its mono or stereo recording? It’s a critical factor in decision making.